Last night Arsenal qualified for the 5th round of the FA Cup by beating Huddersfield Town but it came at the expense of Nasri’s injury and Squillaci getting suspended for three domestic games. After the match, Wenger confirmed that Nasri is going to be out for at least two weeks due to a hamstring injury and admitted that it is a big blow at this stage of the season. He also confessed that he took a gamble in playing him ahead of Rosicky. He further added that losing players now, with so many games ahead, makes it difficult for the team overall. With the knock out stages of the Champions League just round the corner, Wenger also admitted that there is a possibility that Nasri will go on to miss the match against Barcelona. “Nasri looks to have a serious hamstring injury. Usually it is three weeks [out], we have to see if it is a Grade One [strain] because that can be two [weeks]. It is a big blow, how big I do not know because the results in the future will tell, but it is a big blow. Put three weeks to today’s game and you will know [if he misses the Barcelona game]. I think yes. I have regrets now, yes, because the plan was first to play Rosicky but he was still too weak because he was sick. So I took the gamble on Nasri and it back-fired but he could have come on and because it was after 25 or 30 minutes it could have happened as well if he comes on. Regarding Squillaci’s red card, Wenger said that it was a harsh decision but admitted he feared a red card to be flashed. However, Wenger added that Squillaci’s suspension won’t affect the transfer plans. Wenger explained that with three games in a week, Squillaci is only going to miss a week of football. He also confirmed that he isn’t close to signing anyone before the deadline. “I found it harsh but you can give it or not give it. It was a foul, it didn’t look to me like an obvious goalscoring opportunity. Is he the last man? I am not sure as well. But I feared the red card and unfortunately he gave what I feared. It’s back to the FA Cup today and we are at home against Huddersfield town. In the last round we were taken to a replay by Leeds and I hope it’s not the case this time. I don’t know much about Huddersfield but that they are in League One and they are fighting for promotion. This Cup, I feel, will not be a priority for them but still expect a very determined side that faces us today. For the starting team, we can expect many changes and most of our second string to start as we have a Premier League match forty-eight hours after it. Most will be hoping for a strong side, but with a match against Everton on Tuesday, we cannot play the same men twice. And by now you would expect the whole squad to be at the same level. So who ever starts, we can expect a win but we would have to show up and not take them lightly. In goal, I expect Szczesny to keep his place even though Almunia is back from his injury. With Squillaci available, he will be in the starting eleven and Djourou will have a rest. Koscielny, therefore, will be the other centre back. Gibbs and Eboue will be on the flanks as Sagna won’t be risked for this and Clichy will need to start on Tuesday. In the middle, Arsene will have to be decisive. I won’t start with Diaby as he has just come back. Also we would need someone who can control the midfield. We cannot start with Fabregas. However, we can start with Nasri as he started on the bench in the last game. Denilson to retain his place. To partner them, I will go with Song as we will need a good cover for our backline. We can bring on Diaby later when we have the game in control. Upfront, I would start with Chamakh as lately he hasn’t featured much. On the left side, Arshavin needs to continue to improve his confidence. On the right, I can’t make up my mind between Walcott and Bendtner. Bendtner and Chamakh’s combination hasn’t clicked yet. However, Bendtner is improving with games and I won’t be surprised if he starts. Although, I would prefer Walcott to start. This game should be a walk in the park, no disrespect to Huddersfield, considering our team and how we have played these past few games. My only concern is the back line as they will be playing together after a long time. However, if our midfield stays close to the defenders and not lose possession in dangerous areas, we will be fine. No score predictions again as they always turn out to be incorrect. Enjoy the match and keep your fingers crossed. With so many players linked over these past few weeks, and with us short at the centre back position, one would have been hundred percent sure that a defender would be signed in order to make up for the numbers at the back. As it stands the transfer window is almost over and there are no signs that a a new player will be coming. During this transfer window, I haven’t talked much about the players linked because speculations always end up futile. The other reason being that I did an article back in December, where we were in a similar situation, and I had said that to avoid similar situations in the future we must sign a defender in the January transfer window. That article didn’t go down well with the readers. The timing of the post maybe wasn’t good but the problem was there and we still haven’t addressed it. We survived that period and thankfully we have survived it again this month, and I hope we won’t have a similar situation in the future. But we have an opportunity to solve it, yet we haven’t taken it. We still have time but with Squillaci returning, Vermaelen on the way and Song also able to play at the back, there is only one percent probability that a defender will be signed. So that’s that. I won’t go more into this. Wenger knows more for sure and I hope he is right on this one and I hope we don’t have similar situations as we head into the final lap of the season and don’t rue this opportunity. Coming onto other news, Vela is off on loan to West Bromwich. It’s about time that a move has been made because he deserves to play games and staying at Arsenal he was getting many. It’s a good opportunity for him to prove his worth and I wish him the best of luck. Also Arsene Wenger has confirmed that Szczesny is Arsenal’s number one keeper. This has come at the right time as we have looked pretty solid with Szczesny in goal. He still has a lot to learn but with him, there is a feeling the the defenders are more confident. And with Fabianski also doing great, the goal keeper situation looks fine. As for Almunia, he will have to prove his worth but it’s quite clear that he will have a hard time in doing that. That’s all for now. Tomorrow is yet another Cup match and this time the opposition is from League one. I don’t see anything but a win for us. Enjoy the game where ever you are and have a great day. Aaron Ramsey has been loaned out to Cardiff City for a month to get some match fitness and as result be available for selection in the Arsenal team. Having returned from a loan spell at Nottingham forest, Ramsey hasn’t been able to feature for Arsenal due to his lack of match practice and he is desperate to play again. Speaking ahead of his move, Ramsey talked about as to how he would go out on another loan to get into shape and get into the Arsenal team as quickly as possible. Cardiff City has a possible seven games, in which Ramsey can feature, before he returns at the end of February. Regarding his fitness, Ramsey added that he has worked hard on it and feels good but just needs to play some games to get into the flow. As for being out of the game for so long, Ramsey has set himself the goals of getting back to where he was before his injury and be able to play regularly for Arsenal. “If going out on loan again for a month to get a few more games helps me get back into shape quicker and into the Arsenal team then I will do that. I just want to get back to playing regularly and get back into the Arsenal team as quickly as I can. I feel good and my fitness is good. I’ve worked hard on it, I just need to get back into the swing of things, play some games and get my mind switched back on to the atmosphere of a game. Arsenal’s next match is against Huddersfied Town on Sunday in the 4th round of the FA cup. Arsene Wenger today gave the latest injuries news ahead of it. 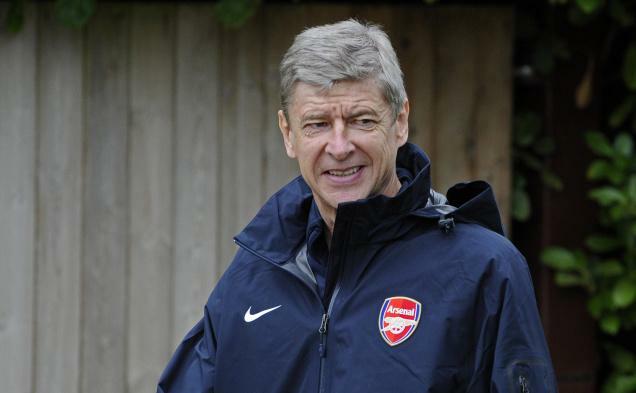 Speaking to Arsenal TV online, Wenger confirmed that Squillaci and Diaby are back in the squad for Sunday’s fixture. Diaby has been out since the end of December through a calf injury while Squillaci has been missing due to a hamstring injury since the 8th of this month. He also told that the only uncertainly is of Rosicky as he could not confirm, due to his sickness, whether he will be fit or not. Whereas, according to Wenger, there is a chance for Almunia to be in the squad, who has been out due to elbow and ankle problems for a while now. But as far as Fabianski and Vermaelen are concerned, they won’t be available. Regarding Sagna, Wenger told that he is good but still has a little bit of headache. However, Wenger added that all the tests at the hospital were clean and he will be available on Sunday or at the most by Tuesday for the match against Everton. “Squillaci and Diaby will be in a squad. The only uncertainty I have is Rosicky. I don’t know if he’ll be fit or not. He was really sick. Almunia has a chance, Fabianski no and for Vermaelen we need to be patient. Arsenal qualified for the Carling Cup final by beating Ipswich Town in the second leg of the semifinal. Andrey Arshavin, speaking to his personal website, talked about the match, his performance and winning his first English trophy. He said that Ipswich came to defend their advantage and stop Arsenal from scoring whereas Arsenal approached the game very seriously with the sole objective to crush the opposition from the very first minute and score an early goal. With the scores zero all at the break, Arshavin revealed that the manager asked the team to continue with the same high tempo and speed things further up to find the goal. He asked the team to keep patience and possession as there will come a time when the opposition would get tired and openings will be created. Arshavin said that they played that way and it led to the first goal which came at the right time. He further added that the goal lifted the inner tension and the game became easier and eventually more goals were scored. He also acknowledged the skill of Bendtner in scoring the first goal and Wilshere’s great pass that led to it. On his own performance and assists, he bluntly said that it wasn’t a super match for him but he is satisfied with the result. He added that he is glad he was useful to the squad. When asked about being favorites to win the tournament, he replied that considering the names they may be but as it is the final anything can happen. He added that it will all depend on how Arsenal play. In the end he said that they deserved the victory and to be in the final and wants to win the first trophy of his English career. “Ipswich came to London to try and defend their advantage. Maybe they tried to play in such a way so that they could score from a set piece while keeping us from scoring. If they had managed to do so, we would’ve had to score three goals in order to win this game. We took a very seriously approach to this game, tried to “crush” our opponents from the very first minute of the match. We expected to score a quick first goal. But after the first 45 minutes, the score was still 0:0. During the break Arsene told us to play in the same high-tempo and try to speed up. He said that there would come a moment when the Ipswich players would get tired and then it would get more and more difficult for them to hold back our attacks. The coach asked us to keep our cool, not to make hasty, ill-considered passes, take care of the ball. He was sure that there would come a moment when we’d press them out. Actually, we played that way and that led to the Nicholas’s goal. I would say that the goal came at the right time. Here it’s worth pointing out not only his skills in finishing this chance off, but also a Wilsheres’s great cross to Bendtner. This goal allowed us to lift some kind of inner tension from the team and our fans. Once we started to lead the score, the game became easier. Soon we scored a good goal from a set piece. It wasn’t a supermatch for me. But I’m satisfied with the result. I’m glad that I was useful to the squad. Well, it was an overall good performance. In the first half we were frustrated alot by Ipswich but in the second half we were better and scored the goals at the right times. We created plenty of chances throughout the match but most of them weren’t clear cut and Ipswich were defending quite resiliently. However, what I enjoyed was that none of the players got panicked and sticked to the game plan. The backline weren’t tested much but did well whenever Ipswich were in our half. The midfiled was dominated by us as we enjoyed lots of possession. Upfront the movemnet was very good along with the finishing. Szczesny (6.5): Had nothing to do all night but to collect the back passes and clear them. Was caught once when he collided with Sagna, otherwise had the goal covered. Sagna (no rating): Lasted for a short while. I hope he isn’t badly injured. Djourou (7) and Koscielny (7.5): They too had very little to do but when called upon, did their job brilliantly. Made some vital interceptions and clearences. Djourou covered up well for Eboue and was always quick to close down the opposition. Koscielny scored an excellent goal with his head. Clichy (7): Good defending at the back and contributed upfront. He is slowly getting back to his best. Keep it up Clichy!! Wilshere (8): A very good performance by Wilshere. Found the right pass and was always involved. Controlled most of the midfield in the first half. Delivered some excellent balls, one of which led to Bendtner scoring. However, he needs to be consistent with it because at times his final ball lets him down. Denilson (6.5): A decent perfomance from Denilson.Should have done better in the first half though. Kept the ball ticking in the midfield. Fabrgeas (7.5): Another top perfromacne from him despite a somewhat frustrating first half. Was involved in every thing and should have scored in the first half on the ball provided by Wilshere. His second half performance was, however, excellent. Scored the killer third goal. Bendtner (8): He clearly was on fire today. Scored an awesome first goal at the right moment that opened up the game. Moved well on the flanks and provided good width. Deliverd in some excellent crosses especially the one which led to Van Persie hitting the cross bar. Howeever, he needs to improve his first touch as at times it let’s him down. Van Persie (6.5): Another good perfromance despite not getting a goal. Moved around well and linked up the play nicely. Was unlucky not to get a goal in the first half. 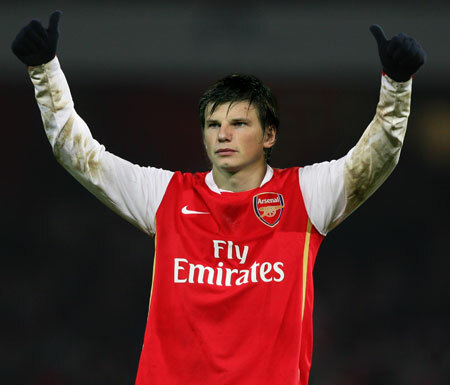 Arshavin (7): Well he isn’t up to his best but he is trying to get there. Made a good start but then went to his usuall. However, woke up to provide the assist on the second and third goal. I hope this does good to his confidence becuase we all know what he can offer Arsenal. Eboue (6.5): Made me nervous as he was always caught out of position. However, he did well when underpressure at the back and provided decent support upfront. Nasri and Walcott: Too little time to make an impact. No ratings for both. You are currently browsing the redgunners blog archives for January, 2011.